Deal – Get upto 10% Discount at Jalavihar Hyderabad Telangana Entry Pass to Water Ride Activities. 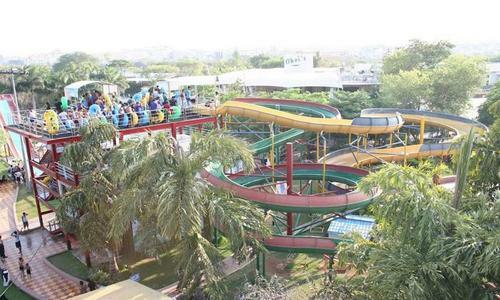 Water park featuring slides & a massive wave pool along with lakefront lawns & food vendors.Make some fun memories at Jalavihar, an amusement park filled with rides suitable for adults and children. It is located on Necklace Road and is right next to the Hussain Sagar Lake that gives an incredible view. It also features a party zone, meeting areas that are ideal for parties, festival events and corporate events. They also have a food court to satisfy those hunger pangs whilst the fun. The staff follows strict hygienic conditions to make sure that doesn’t stop you from having fun. You will get option to create Nearbuy account during voucher purchase. Just click link given in the post and that will redirect you offer page. There you need to select offer and quantity and proceed for payment. Before payment Nearbuy will ask you for registration. It’s very simple. Sorry, as per latest info from nearbuy they are stopping any coupon code. We updated our post accordingly. The casback amount i recieve by buying jalvihar tickets can be used on any deal? Or only on outing activities..! I just wanted to know if i can use the Cashback amount for buying food deals.. Yes, you can buy any deal on Nearbuy.com website using those cashback, there will be no restrictions. Also you can use whole cashback amount in a single transaction there is no limit restrictions. Hi.I want to pay the bill through debit card.where do I get the cash back?Does the cashback be credited into debit card or this nearby account?requesting a reply asap..!!! Cashback will be in your Nearbuy account, You can buy other deals on nearbuy once it appear in your Nearbuy account. Hi I just registered my account, and now I am planning to book Jalavihar 5 tickets for this weekend..but where I can enter APNACOUPON promo code to get 35% off? Once you buy voucher, you will get voucher in your email inbox as well as in your Nearbuy account. Take printout of the voucher and visit park as you wish.